Four new tracks from Purity Supreme. Purity Supreme is a collaboration between French musician, composer and producer Christophe Van Huffel and American writer, musician and composer Leslie Winer. “Always Already” was recorded in France at Studio7Love in May 2011. Leslie Winer’s 90s album “Witch”, released under the artist name ©, is a genuine lost classic, pioneering many of the sounds that have followed. Since this prescient release she has chosen to work in the shadows. Leslie’s voice has graced recordings by Bomb The Bass, Jon Hassell and Holger Hiller, and her words used on “This Is”, the lead track on Grace Jones’s latest effort. Alongside Purity Supreme, she is currently writing short stories to be published by The Bookworm. 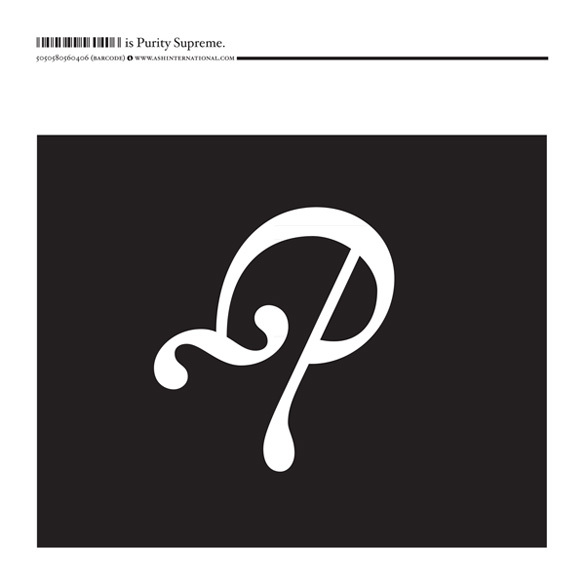 Unusual and striking experiments in song form called Always Already (ASH INTERNATIONAL ASH 10.1) by Purity Supreme. I like the way the package presents a stern countenance explaining very little, assuming that we all know the parties involved; already the release feels like an odd riddle. Two songs on the A side. The main attraction to the listener is the singing-intoning voice of the lead fellow, who may be the French half of the act. Cracked and dusty his vocal cords be, whether through mannered device or naturally desiccated, trying to convey the effect of a dissolute and broken man. Just right for followers of Wm Burroughs we might think, but this sort of prose-speak-sing also shades into areas once occupied by Nick Cave or Michael Gira, as does the lugubrious and dense content. The lyrics are highly ambiguous, even when they seem straight to the point and use plain English at all times. I like to hear multiple repetitions of slightly mysterious phrases in songs and Purity Supreme does this trick very well. The first song keeps saying “It’s Nice To See You”, when the mood of the singer and indeed the music itself is expressing the exact opposite of that sentiment, and it’s a song that wishes we would just go home and stay there. Angst-ridden steel strings and a relentless drum pattern make this snarky item a vicious twin brother to Leonard Cohen’s later works. The second song is slightly more recognisable as something a weary Lou Reed might have recorded at any time between 1975 and 1988, and with its basic guitar and drum sound could almost pass for any decent slab of indie art-rock music. On the flip, even more words and more repetitions in the two remaining songs. So many words, these songs are more like recited poems or short stories really, very much like a slightly nastier Tom Waits or what we might hear if Charles Bukowski turned his throaty husk to song. Indeed the words are privileged by appearing in full on the front cover. And there’s a very strong cinematic component too, with vivid film noir images somehow encoded in the very sound of the record. Narrators alluding to scenes unknown, to backstories we cannot know, and delivered with a snarling curl to the lip at all times. The creators here are the French musician Christophe Van Huffel, and the American writer-composer Leslie Winer. Quite unusual, muscular, and opaque music from these offbeat modern beatniks. Ms Winer surfaces again, rare and unpredictable like a lone, great sea creature whose path and life is unknowable, except for these moments. We must mark the place and start triangulating. Once. she appeared in one corner of the night sky, and disappeared out the other, and some would say that appearance sprinkled the dust that spawned the “trip-hop” genre. Witch . Her work tends to hold a superficial attraction that quickly leads you on to finding a depth that rewards the consideration. And if the individual pieces are not pop-song short, their careful construction insures the interest… and then cuts out leaving you wanting. In Christophe Van Huffel she has found a worthy creative partner. He brings sparkling guitar based aural textures that dance around Winer’s more text centered genius. The natural song forms he uses add structural sense to the slow, deliberate momentum of the spoken story. It would seem Winer likes to make you work for the words, only to find several possible interpretations. The choice, of which equally as wonderful interpretation, dances just out of reach with the guitar, and by the end you have to decide to wait until next time to decide. Where most who work collage of found material and the re-appropriation of cliché court the bad taste of someone trying to snake credit for the strength of the original work, Winer’s strong and careful craft not only justifies any appropriation, but brings an added value. These “songs” sound great. I can enjoy just driving around with the “Famous inhabitants of Louth” playing along like the track to some classic great rock track I can’t quite remember… while Winer’s voice burbles on about something that sounds important (in this, it is perhaps, the most aleatoric seeming combination of music and words on the EP). “Milk St.” is a short film noire – the gated, distorted guitar like an industrial machine angrily spinning up to disintegration over eternity’s harmonium drone, but it is “nice to see you”. “Half past 3 cowboy” is like being “stuck inside a fairy ring” with the ghost of your Dickinson loving, very stoned college girlfriend – the bottleneck whines on like the soundtrack to Performance is being played by your roommate… all in all, an ambivalent acid-trip you were glad to have taken, in retrospect. “Dunderhead” is a character sketch, she explains herself to herself, as she deliberately marches across the great plain. The drums, the riff, the march builds and builds… this is no country for old men. Dunderhead is serious, and GOING TO TOWN! But… “it’s all good”. Sometimes her narrative is wearily cyclical: “I got stuck inside of a faerie ring / Jesus, I couldn’t get out,” she repeats on “Half Past 3 Cowboy.” Sometimes there’s gory wordplay: “I got a couple of drops of Indian blood, mostly on my hands,” she drawls casually on “Dunderhead.” There is disjointed closeup imagery, as when describing a watch, a propos of nothing, on “Famous Inhabitants Of Louth.” Typically Winer repeats the full lyrical cycle, an interesting choice that calls attention to certain passages in an important way, constantly dodging and shifting. Leslie Winer était un mannequin de New York, écrivain et fauteuse de trouble, dans les années 1970 et 1980, qui a travaillé comme apprentie auprès de William S. Burroughs et a fréquenté des gens tels que Basquiat. Véritable touche-à-tout, elle a enregistré, en 1993, un album incroyable intitulé Witch, de la soul avant-gardiste infusée de dub qui combine les influences de Last Poets, Annette Peacock, Captain Beefheart et Public Image Limited dans ce qui est devenu, sans conteste, avec le temps, mon album préféré. Il est véritablement sans équivalent, souvent imité mais jamais égalé. La voix teintée de nicotine de Winer est le lien qui unit tous les morceaux de Witch, la poésie de ses courants de pensée assénant ses observations sur la politique du sexe, la guerre, le commerce et la communauté. C’est une voix qu’il vous est impossible d’oublier une fois qu’elle est entrée dans votre tête et c’est ce qui rend sa relative disparition après Witch si troublante. Malgré quelques rares apparitions sur les chansons de différents artistes et la tenue de l’un des blogs les plus passionnants depuis le début du siècle, Winer n’a jamais vraiment donné suite à cet album. En 2010, le label britannique Tapeworm a sorti une impressionnante cassette, en édition limitée, réunissant les enregistrements qu’elle avait effectués dans les années 1990 (cette cassette est d’ailleurs devenue mon archive préférée de l’année) et désormais, Dieu merci, Ash International a pris le relais en sortant de tout nouveaux morceaux de Winer, chose qui n’était pas arrivée depuis bien trop longtemps. Always Already est un maxi 4 titres, de 21 minutes, proposé par Purity Supreme, un duo composé de Winer et de Christophe Van Huffel, un Français multi-instrumentiste. On peut dire qu’il ne déçoit pas, reprenant les atmosphères qui ont fait la marque de fabrique de Winer en les revêtant d’un blues poussiéreux envoûtant, sa voix plus rauque et plus sèche que jamais. Le morceau d’ouverture « Milk St. » commence par la voix de Winer entonnant sèchement « It’s nice to see you », comme dans un état d’ébriété, tandis qu’un épais nuage de feedback de guitare et de percussions, rappelant les ondulations d’un serpent à sonnette, enveloppe sa voix. Cette atmosphère se poursuit, tout au long du morceau, avec l’introduction de boucles de percussions et de guitares roulant comme les buissons d’herbes sèches d’un western dans le quartier pauvre de Bowery, complétées par un sample occasionnel ou le clapotement d’un son métallique, pour accentuer le tout. Mais les véritables stars, ici, ce sont les paroles de Winer. Il est d’ailleurs vivement conseillé de mettre un casque pour mieux s’en imprégner. Elle a toujours été une brillante sculptrice prosaïque, capable de planter un décor désinvolte, d’instaurer un environnement, une ambiance et une mentalité, décortiquant le plus profond de son être dans une description saisissante. Je n’ai pas pu m’arrêter d’écouter ce disque depuis sa sortie ; c’est une évolution phénoménale renfermant tout ce qui a fait d’elle un personnage stupéfiant depuis le début et que je ne saurais trop vous recommander. Bon retour, Leslie… « it’s nice to see you » (quel plaisir de vous revoir). A quality of Leslie Winer’s work is that it resists or defies any analysis that could really come close to revealing its dynamic, questioning nature. In the same way that the songs themselves demonstrate the struggle to capture the elusive noumenon of objects, feelings or experiences, so the language that is necessary to describe both the music and the words is inevitably drawn towards (and, as a look at reviews elsewhere will show) must resort to easy analogies or trite categorisation. To really grapple with these songs’ concerns is to enter a vertiginous, dizzying, but exhilarating vortex where, if there are any ‘answers’ then these are not to be found on the level of language (the Soviet psychologist Vygotsky compared a thought to ‘a cloud shedding a shower of words’) – which is merely the point of departure ; better to follow the example of the characters in the Ealing comedy the Lavender Hill Mob, whose descent down the spiral staircase of the Eiffel tower – shedding accoutrements en route, gives them the opportunity to achieve an altered state of consciousness by letting themselves ‘be’ in the moment – beyond thought-language-reason and enter into something that looks like pure joy – or madness. Dunderhead, for example, the fourth track on the Purity Supreme ep ‘Always Already’ – a collaboration between Leslie Winer and Christophe Van Huffel, could easily be labelled with the nearest glib adjective such as ‘cinematic’ or ‘macabre’ etc. or use references to ‘Badlands’ or ‘Deliverance’ (just as I have myself made an (easy?) reference to an Ealing film) and yet whilst it is not hard to see why those labels/references might be used, to do so would not be so much to scratch the surface, as to gorge on the surface alone – to the neglect of everything else – like a pig hunting truffles (well, a not particularly well trained pig). In Japan there is a bath toy that resembles a bar of soap and which, when immersed in the water, begins to spin, effervesce and disintegrate, to eventually reveal the plastic thing concealed within. This track – as with each of the other three songs on the ep, works in a similar way; except that the fizzing, coruscating nature of each, as its concerns are addressed – I hesitate to say ‘revealed’, is ongoing – and whatever “meaning” can be inferred has to be continually revised – refusing to yield to the final death knoll of any fixed interpretation. The concern is with the liminal – with exploring the reality (the word itself is inadequate) that whatever we experience or perceive can only be unsatisfactorily described through fallible words and senses. The words used are just the shed skin of the thing that was experienced.